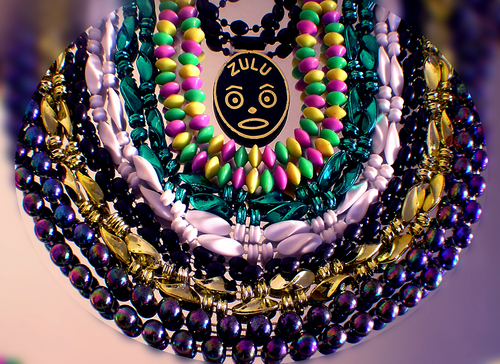 Founded in 1909, “Zulu” has a rich history which runs through the entire fabric of the city. In the past, enslaved Africans and free people of color were not allowed to participate in the pageants, parties, and parades of Mardi Gras. Prior to the Civil War, open gatherings of enslaved African-Americans were strictly controlled. After the Emancipation, the end of the war, and the 13th Amendment, public demonstrations and celebrations became common. People of color were able to, at a minimum, take to the streets, carrying the Mardi Gras spirit from home to home. As Carnival in New Orleans evolved and grew, so too did the participation of African-Americans. The signature “throw” of the Zulus is the painted coconut. Zulu historians say the tradition goes back to the club’s early years when the members were unable to afford the glass beads thrown by white parade krewes. Over the years, the Zulu coconut has become among the most cherished catches of Carnival; but like most things it has been forced to evolve. The first coconuts — purchased by riders at the French Market in lieu of more expensive beads — were handed out raw and “hairy.” In later years, the coconuts began looking more like those we see today, with elaborate decorations and markings. The problem though was that the coconuts, though beautiful and festive, still could weigh as much as a pound and a half which could cause serious problems for spectators when thrown from parade floats. By now you can guess what comes next: By 1985, lawsuits over alleged injuries from Zulu coconuts thrown during the krewe’s annual parade sent insurance rates skyrocketing forcing the krewe to ban the beloved, hand-decorated throws all together. In a quintessential New Orleans move, city and state political leaders stepped in to save the tradition. With the backing of New Orleans Mayor Sidney Barthelemy and Gov. Edwin Edwards, the state Legislature in its 1987 session enacted SB188, which became known as “the Coconut Bill.” The bill (which became law in 1988) added Zulu coconuts to a list of items (such as beads, doubloons and cups) that enjoyed official immunity from personal injury lawsuits. The one condition of the law was that coconuts must be handed down from the floats, and not thrown. Sounds reasonable enough. A Mardi Gras tradition was saved. Today’s Zulu coconuts are shaved down and drained of their milk and meat, making them much lighter than their predecessors (today’s version are in the 2- to 6-ounce range). I am proud to report that I did not see one coconut being thrown from a float this year: they were all handed to ecstatic recipients in full compliance with the law—including yours truly. Long live Zulu! Contact the personal injury attorneys at Sigmon Law PLLC if you have any questions.